What a day… and oh what a night! 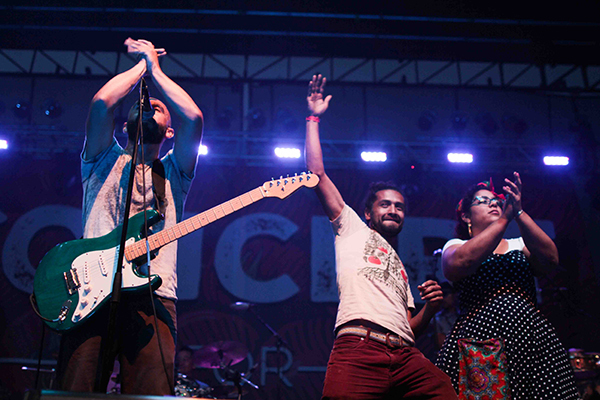 From left to right, Raul Pacheco of Ozomatli, the CIW’s own Pedro Lopez, and Marisoul of La Santa Cecilia gather on stage for one last, collective encore to an amazing musical evening. Largest Fair Food march in years, electrifying music festival mark joyous celebration of twenty years of struggle, progress for farmworkers in Florida! Check back later for much, much more from yesterday’s huge Parade and Concert for Fair Food — including more on some very important news from the Student / Farmworker Alliance! Twitter blowing up as Fair Food activists make their way to St. Petersburg! Parade and Concert for Fair Food Photo Report: Bouncing by the Bay!